Mouse over words and things to see where they come from. 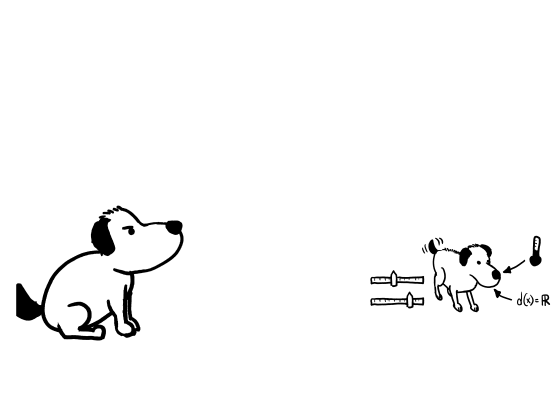 The dog gains a pound for every $10 donated to the wikimedia foundation via this link. Okay so by the looks of things... It's a variable comic. I'm not sure where or how. What is even happening? By the look of things, he's having fun with HTML5 and hashing. Last edited by Nic the Man on Mon Apr 01, 2013 7:52 am UTC, edited 2 times in total. I expect the dog to be able to bark the Intel jingle if I donate $20. The company and the two schools r dynamically generated, right? Anything else? I think the dog size/the amount donated is also dynamic. Since no one has mentioned it yet: It seems this is a competition. 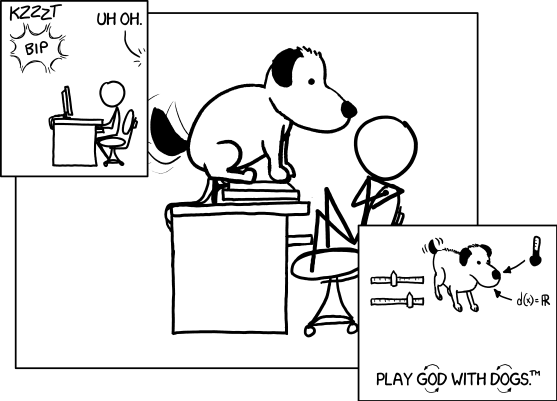 Break the hash at http://almamater.xkcd.com/ and you'r school will be selected for the comic. Let the fun begin (comic seems broken right now, though). The dog is getting so big! So many donations so far! Darn, seems like my donation broke the comic. Whoa. Where did that come from. Poochie is hugie! Dammit Teaser. The e-mail address seems like it changes with the dog size too...? The forum word-changer is making this conversation seem very surreal. I have a very vague idea of what is going on here. Which is to say, I'm pretty confused. 'Google' changed to 'Intel', thanks to Nneonneo who ingeniously edited the wikipedia article on 'Technology'. Great way to get funds btw, lured me into donating for the first time. Edit : not sure how I got to see the last one, which is apparently bigger than the current one? Well, since most people are getting bored of t-i-m-e (except for those popes and cardinals I suppose), I guess Randall is using this one to continue keeping us from doing any more useful stuff. I've seen the bigger poochie too, the comic glitched a while ago, it probably got too big too soon. So, I can access the comic just fine on Firefox but it doesn't exist on Chrome. Anyone else having the same issue? I definitely want to see the hippopotamus, elephant and brontosaurus-sized dogs. Somebody take over, I'm going to bed. Last edited by cdxf6465 on Mon Apr 01, 2013 9:33 am UTC, edited 2 times in total. I edited the comic. Hi Amazon.com, Inc.
Last edited by pitareio on Mon Apr 01, 2013 10:37 am UTC, edited 1 time in total. Ah, I see, it changes the comic based on the leader! Ah, I have been (once again) banned from Wikipedia for unwarranted, plagiaristic edits, but I must say that it was absolutely worth it for the brief few seconds that 'Adobe' was the company in question. Noted that the stick-figure's response changed when the company changed; is it possible that there is a custom response for every one of the 100 companies? It's unfortunate that's not a value we can edit for long. 'Google' is only mentioned in the references, though it appears that recently someone has removed that and replaced it with 'Amazon'. I am really curious to see what every possible result would yield! Didn't take very long before someone protected http://en.wikipedia.org/wiki/Research . Give us our money back! OK, so for the benefit of people who come by later and are confused by what the big deal was: Many things in this comic change, depending on external sources. If you leave the page open, it automatically updates itself every so often from a data-streaming server (same one being used for Time - it's probably how they could get Time's fancy streaming load-balancing system up so quickly when that turned out to be overloading the servers, they already were getting it built for this). 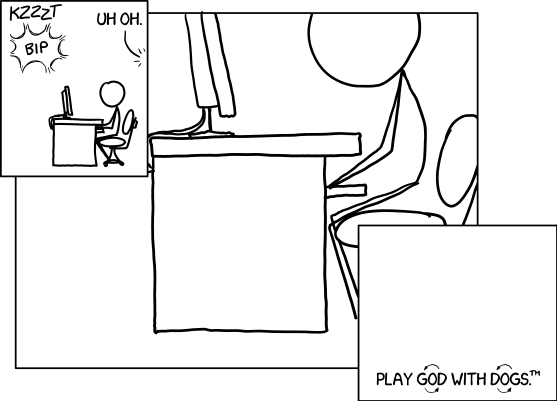 For what I'm guessing is a big 1 April thing, xkcd is running some sort of crypto challenge, to break a single Skein hash, here. Some number of different universities are working on it, to various degrees of success. The university who's currently in the lead (as of this posting, Stanford, who's managed to find a string that, when hashed, matches the target hash on 622 bits, getting 402 bits wrong (for a purely random string you'd expect 512 and 512, so that's better than average, but still a long way to go). The name of the university in the first panel, and the text of the fourth panel, depends on which university is in the lead. The text in the fifth panel, including the text on the application itself, depends on which university is coming third. Hey berkeley students! // We borrowed the botanical gardens' net to catch promising recruits. Hey stanford students! // We hired a new recruiting startup to help us hire Stanford students. Hey uw students! // Our recruiting team is on the lookout for promising young uw graduates. or Cal graduates. provided any of them manage to fill out the application right. // Name: SEGMENTATION FAULT // Email: save trees // Education: Contra dancing. Meanwhile, it's watching various Wikipedia pages, to catch which (NASDAQ-100) company is the first one to be linked to in that page. Obviously, that page is currently being vandalised to all hell, as any Wikipedia mention on xkcd seems to cause, because people are morons. 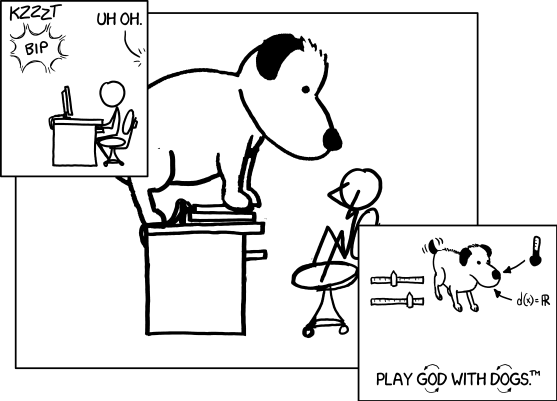 Which leads Wikipedia to protect the page, and then xkcd changes which page the strip watches. Anyway, whichever company it picks up is mentioned in panel 1, and changes the text of panels 2 and 3, the caption at the top of panel 6, and the email address in the final panel. Do I get a free hard drive? // Only in my darkest moments. // You'll be part of a dynamic research team envisioning the future // It probably looks cool. // Yeahhh // We're so close you can get to us by roomba. // At Seagate Technology., you'll have the opportunity to work on cutting-edge projects. // careers@Seagate Technology. Have you thought of a career at Xilinx, Inc.? // What do they even do? // You'll be part of a dynamic research team envisioning the future // It probably looks cool. // Yeahhh // We're a convenient four hour drive from New York City (15,000 hours by roomba) // At Xilinx, Inc., you'll have the opportunity to work on cutting-edge projects. // careers@Xilinx, Inc. I've also seen one for News Corporation, and others have mentioned it saying Intel, but I don't have the full text for those. 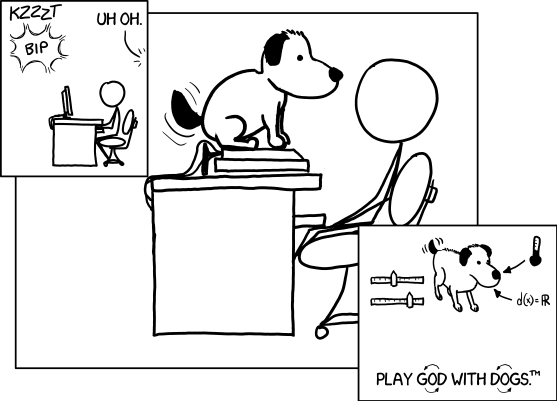 Finally, there's a xkcd April-first donation drive for Wikipedia being run (probably to make reparations for the above), and the higher the donations, the larger the dog that appears in the bottom panel. There are other posts above cataloguing all of these images. Last edited by phlip on Mon Apr 01, 2013 2:02 pm UTC, edited 7 times in total. Originally the NASDAQ company was taken from the wikipedia page on Technology, but that page had been protected fairly quickly. I reckon the page will keep changing. Busy day for the wikipedia mods! Let them earn those donations! They're so paranoid. Oh boo hoo, so someone is having a bit of fun. Pff protected. That's probably because 10 people are vandalizing at the same time. 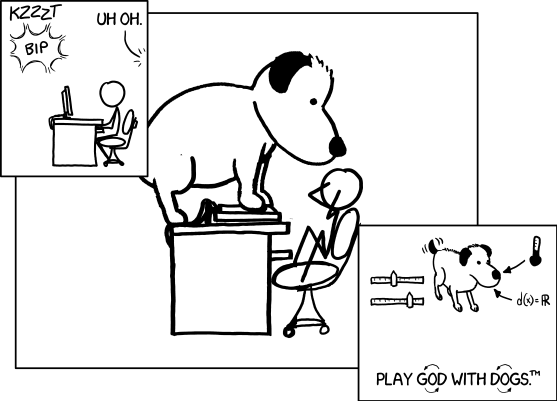 Nah it looks like the xkcd server only checks the wikipedia page every couple of minutes. I changed it to eBay, and refreshed both the xkcd page and wikipedia. About a minute later, the comic updated to show eBay, and a few seconds later someone edited it to QUALCOMM, but it took another minute or so for the comic to update. What idiot keeps vandalizing with Microsoft? We've seen it already! Im trying to blank the page so we can see what happens to the comic. That Luk guy is really fast at reverting it though. teelo wrote: |'m trying to blank the page so we ca­n see wha­t happens to the comic. C­an w­e fi­nd th­eir ti­mezo­ne o­r IP? Last edited by hordriss on Mon Apr 01, 2013 10:30 am UTC, edited 1 time in total. teelo wrote: Im trying to blank the page so we tin see hwæt happens to the comic. It just keeps the last one it found. Has been done hours ago. On the Internet, nothing is new. Last edited by teaser on Mon Apr 01, 2013 10:30 am UTC, edited 1 time in total. Don't think so. He is a "janitor" (lol). A mini-admin. He banned me for 31 hours, but whatever. Dynamic IP. Brb to keep vandalizing! I find it funny that this guy has nothing better to do than sit there ruining our harmless fun. C­an we fill it with Alt + 0173? It's all fun and games until the placement of the knobs produces innocent real-world bystanders. Sueños del Sur - A webcomic about four siblings, their family, friends, adventures and dreams. | want to kno­w how to change the melons sentence and the first part of the email address. NVM, it's related to the alma mater. Last edited by hordriss on Mon Apr 01, 2013 10:41 am UTC, edited 1 time in total. No, it's new, and it looks very much like the code that was used for the Tіme comic this past week. I'm thinking that was a testbed for this one. A test that may have gotten out of hand. Added: I'm sore tempted to abuse my Wikipedia admin rights. Stay good, KarMann! Stay good! Also added: This makes it quite easy to use the script that was developed for the Tіme strip to get the relevant data for this one, with a little straightforward adaptation. Too bad I haven't been logging since the beginning; I only have less than the past hour now.